Small, luxurious hotels, known as boutique hotels, are rising in popularity due to their intimate ambiance. The smaller scale allows them to change and evolve more quickly to current trends than some of the larger, busier hotel chains. Some trends that have been big recently include remarkable experiences, less emphasis on busy locations, and increased technology. Boutique hotels allow guests to have their own private getaway far from everyday life and daily responsibilities. Take a mini vacation without traveling to far-away exotic places by booking a room at a boutique hotel. Being outside of the city or other high-traffic areas can expose travelers to a one-of-a-kind local experience that they wouldn’t get anywhere else. This atypical event can be a big draw for people looking to escape their normal routine at home. 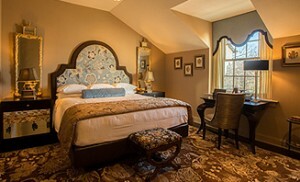 Guests can often choose from a variety of room options, including themed ones to add to their getaway mood. This can be enhanced by matched bedding collections, such as those offered by Thief River Linen. Cohesive looks using color-coordinated beddings, upholstery, paint, and other décor can create a unique look for every room available. Visitors may even end up with a particular favorite that attracts them to return to the same hotel multiple times. Thief River Linen’s vast array of fabrics and various collections allow them to help create several different theme options for these kinds of hotels. For larger hotel chains, location is everything. Their guests want to be in the center of activity with easy accessibility to food, entertainment, and other amenities. For boutique hotels, being secluded or hidden away from the rest of society is more attractive. Local foods, beverages, and services that you might not see in a normal city setting can be a large part of the allure of boutique locations. For a trip away from the hustle and bustle of larger cities, try looking for a smaller, individually owned place to stay. Technology is providing more seamless transactions and entry to these new, high-tech hotels. Keyless entry, digital check-ins and bedside tablets are just the start to what some of top hotels have to offer. Access your room via fingerprint or retinal scans for a secret agent-style entry is available at certain upscale locations. The Upper House in China is virtually paperless and offers guests fully loaded iPod touches, free and unlimited broadband access, and even the hotel’s cars have Wi-Fi. Some hotels take technology to the extremes to provide guests with luxuries they won’t get anywhere else. Valuable information. Lucky me I found your website by accident, and I am stunned why this twist of fate didn’t happened earlier! I bookmarked it.